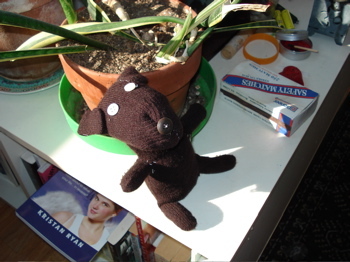 Here’s the soft glove dog that I made following the pattern from Miyako Kanamori’s Sock and Glove book. We gave him a British-sounding name, but I’ve since forgotten what it was. Anyone want to name him? The TooBoo crew went to see Stephanie Pearl-McPhee, aka “The Yarn Harlot“, speak a while ago and she handed out yarn and needles to make squares for Warm Up America! (I’d like to help on their Web site, I tried to spare you from the hideous intro page) while she spoke. Kate and I didn’t use that yarn for the intended purpose, but months later, we finally got our act together and sent the yarn squares that have been languishing in our dresser to Warm Up America! I unpacked them to get one final shot for the blog (complete with grazing kittens) and then had to pay for Priority mail because the post office guy said I had insufficient tape. meh. Cassandra tagged me with the “listening while knitting” meme last post. I think that for me it applies more to “listening while cooking or baking.” Most of my multitasking energy from knitting goes to fending off the yarn-crazed cat. Like Cassandra, I like to knit while watching dvd’s. This weekend, I locked the cat out of the room and worked on my Vogue knit.101 airplane pillow while watching “Shoot ‘Em Up.” I know, I know, strange combo, but it worked well because I was able to pause while I looked up ssk on youtube. Watching the knit witch’s tutorial helped me make the cognitive leap of how to do this elusive (for me) stitch. Cassandra had patiently explained it to me already, but I just kept resisting. I’m forced to employ a sappy simile here: yarn, like life, tightens up and resists when you try to take it in the wrong direction, and only by easing up does everything fall into place. “Shoot ‘Em Up” also had a knitting moment where Clive Owen takes his knitted sock and places it on a newborn’s head, but otherwise, yep, completely unrelated. For “listening while cooking or baking,” it’s usually whatever’s on my running mix. 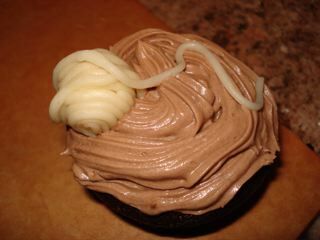 Here’s a pic of a recent cupcake experiment, VeganYumYum’s marzipan knitting. Okay, Lauren. You’re tagged now. Let’s see what you’re working on. I know this is supposed to be a knitting blog, but Miel the yarn-crazy cat is always up in my grill, so I have to be creative. On New Year’s day I made these paper cup holder bracelets, inspired by Susan Powter‘s bracelets. Guaranteed to make you feel like Wonder Woman (modeled by Kate). I have all of these great photos of my Halloween costume, that I never got to wear to the parade because I had a crazy dry/infected eye that just didn’t go with the mermaid theme. I did wear it to a party and I think our table was the only one where the women’s costumes didn’t all look like strippers. Not that there’s anything wrong with that, but a little creativity, people, how many naughty nurses can one bar handle? (rhetorical question). I’m also posting the eggnog cupcakes (from Bittersweet) that we had for Thanksgiving at Cassandra and Owen’s that were decidedly not eggnog-like, but still really damn good. And, to bring us up to the current holiday, the soaps that I made with characters on them that supposedly say things like: love, tranquility, energy, but that probably actually say something completely different. And, the iPod holder that I made for Kate. It was super-easy and one of the many cute things in Vogue’s Knit 101 book. Inspired by Cassandra’s too cute amigurumi, I’ve been sewing felt creatures from “The Cute Book”. Sabre helped me to master the elusive french knot and I’m flexing my sewing muscles for my Halloween costume this year, check back later for details. I finally finished the scarf to go with my spaghetti strap dress, just in time for Kate’s niece’s bat mitzvah. Cassandra commented that it looked like scribble lace, which was unintentional. I finished it on our roof, before it got too cold and where I could escape from Mel for awhile. I also made some rosewater pistachio cupcakes as a test run that knitting circle has not had a chance to try yet. They have cardamom and a wonderful tea taste that is a little like licking someone’s grandmother, but in the nicest possible way.